The Dutch police services near the Rotterdam harbor complain about the great number of overtime hours they are having to perform in order to keep arresting illegal immigrants trying to head for the UK. As Brexit is nearing (March 2019), immigrants from mostly Albania and several central African countries are trying their luck to get to the UK by crawling into containers heading for the British shores. Especially the truck parking near the harbors of Antwerp and Zeebrugge (in Belgium) and Rotterdam (in Holland) have become their preferred hunting grounds now that Calais (France) is closed for ‘illegal crossing’ business. The numbers are rising every week. Last Friday police arrested 25 Eritrean illegals who had climbed into a Spanish fridge container parked near the Moerdijk container terminal. The Rotterdam police has taken into account that the group of North Africans actually wanted to travel to England illegally via Belgium, but that the group was forced to move to the Netherlands because of the tightened immigration checks of last week in Belgium (as there had been a shooting between immigrants in a truck parking near Zeebrugge). In addition, eighty Eritreans were arrested over the weekend. 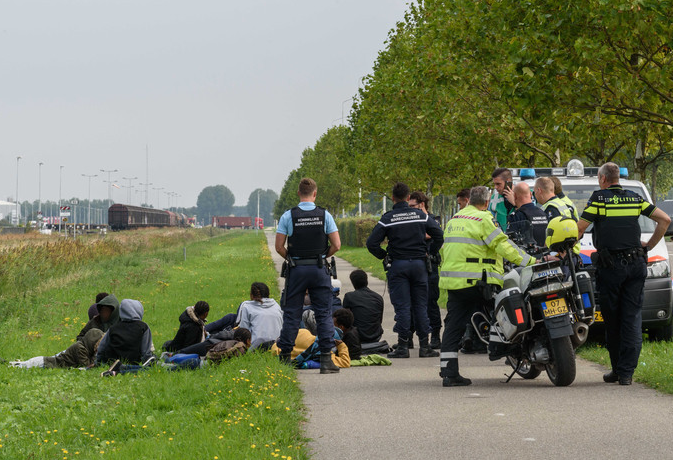 "Even at the Hazeldonk border crossing, in Waalwijk and on the Distriboulevard in Moerdijk, we have groups of Eritrean and Sudanese refugees on those days," police officer Mr. Van den Noort explains. "We regularly see individuals or small families in trains that request asylum here and that we send to the asylum procedure. But larger groups in trucks want to go to England." Except for African immigrants, the Rotterdam police notices a lot of Albanians trying to get to the UK recently. According to police records this concerns ‘economic’ refugees trying to find a better life in England and therefore hitching a ride on a truck. Police do admit that the problem is growing and are asking local politicians for help. Ever since France closed the Calais crossing to the UK and is regularly patrolling there, the problem has mostly spread to Belgium and Holland.